According to the Daily Mail, British taxpayers are to provide £1million for a jail in Nigeria to take convicts whose crimes were committed in the UK. Apparently it costs GBP30,000 per year to keep a prisoner in jail - GBP12,000,000 per year for the 400 Nigerian prisoners in question. 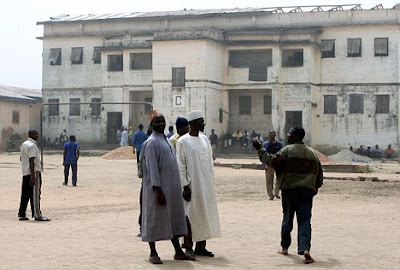 Building a prison for GBP1,ooo,ooo in Nigeria makes good financial sense from the British government perspective. the UK government to build a prison in Nigeria, na im be say we will have expatriate prisoners. Nick Griffin:"Frankly they need to sink several of those boats"
The EU should sink boats carrying illegal immigrants to prevent them entering Europe, British National Party leader Nick Griffin has told the BBC. The MEP for the North-West of England said the EU had to get "very tough" with migrants from sub-Saharan Africa. Pressed on what should happen to those on board, he said: "Throw them a life raft and they can go back to Libya". Libya has long been a staging post for migrants from Egypt and sub-Saharan Africa wanting to reach Europe. Nearly 37,000 immigrants landed on Italian shores last year, an increase of about 75% on the year before. But with the prospect of a new immigration and asylum policy being voted on this autumn by MEPs, Mr Griffin is advocating measures to destroy boats used by illegal immigrants to reach the EU's southern coastline. In an interview with this week's edition of BBC Parliament's The Record Europe, he said: "If there's measures to set up some kind of force or to help, say the Italians, set up a force which actually blocks the Mediterranean then we'd support that. "But the only measure, sooner or later, which is going to stop immigration and stop large numbers of sub-Saharan Africans dying on the way to get over here is to get very tough with those coming over. "Frankly, they need to sink several of those boats. "Anyone coming up with measures like that we'll support but anything which is there as a 'oh, we need to do something about it' but in the end doing something about it means bringing them into Europe' we will oppose." what criteria determines ownership? policing ? It just sounds ridiculous on one front and hilarious on the other. I don't believe that Nigeria is in the position to be able to stand up for itself, it's proven to lack structure and morals in certain areas and probably isn't taken seriously by most countries and people in positions of power. Any reason to object just probably wouldn't stand, as we can't even claim that our standards are 'there yet'. Considering that is what the British did to Jewish people fleeing to Palestine post WWII aftermath, I would not take it as flipant remark. Is this man making the statement aware that if the British sink a ship deliberately, and anyone on board the ship dies from the sinking boat, that the British would then be charged with murder? And there would be MANY MANY charges. Africans are not strong swimmers in general. Weighted down with clothes, no one is! I wish I could laugh at this, but it is this type of inhumanity that allows things to get worse. How about the UK and others stop exploiting Africa to the point that no one in Africa can make a decent living? And they could also stop giving props to African leaders and governments that steal from their own people too. Maybe if they did that Africans could live long and healthy lives in Africa. Africans love their continent. They don't want to leave, the powers that be make it neccessary.